The makers of OREO, RITZ and TRIDENT are helping to bring the world’s hottest boy band to Philadelphia! As the title sponsor of the 2013 One Direction North American Tour, the show-stopping cookie, cracker and gum brands will be giving fans a chance to experience an “exclusive look” from the tour this summer – whether they’re in-concert or not. Check out the News section of 1DVIP.com, where 1D VIP Tour Correspondent Kylie, will bring a “first look” at the tour through regular posts from the road, making stops in major cities. The 1D VIP mobile app is also available for download to give fans the inside scoop on all things 1D! EAST HANOVER, N.J., May 22, 2013 // -- Getting in on the action of this summer's hottest, sold-out concert isn't as impossible as one might think; thanks to the makers of OREO, RITZ andTRIDENT. The title sponsor of the 2013 One Direction North American Tour and its show-stopping cookie, cracker and gum brands will be giving fans a chance to experience an "exclusive look" from the tour this summer – whether they're in-concert or not – with a full-scale campaign. Today it kicks off with the announcement of the "1D VIP Tour Correspondent." After a month-long, nationwide search, Kylie Keene ofPortland, Maine was selected for 1D-nation's most coveted job after proving to be the ultimate snack-loving, sweet-talking, socially-savvy candidate in a contest that generated mass excitement across 1D fan sites and social media communities. By choosing Keene as its tour correspondent, the makers of OREO, RITZ and TRIDENT continue their tradition of providing fans with once-in-a-lifetime experiences. 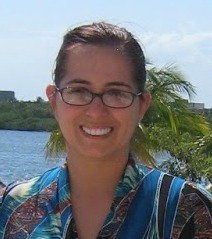 Starting in June on a new blog on 1DVIP.com, she will bring a "first look" at the tour through regular posts from the road, making stops in major cities with the Nabisco One Direction North American Tour including Miami (June 14), Philadelphia (June 25), Chicago(July 13), Dallas (July 22) and Los Angeles (August 9). In addition to sharing a fan's-eye view of sold-out shows through photos and content from the tour, Keene will give visitors to 1DVIP.com the ultimate access to all aspects of the tour including interviews with concert-goers along with exclusive giveaways via weekly updates. "It is incredible to see snacks and pop culture collide to satisfy the tastes of the people and engaging a fan to work on behalf of our brands in this capacity is a first for us. We couldn't be more excited about sponsoring this tour and to have a correspondent bringing content to the masses makes it even better," said Stephen Chriss, Senior Director, US Media and Consumer Engagement at Mondelez International. "Through Kylie, snack brands like OREO, RITZ and TRIDENT are able to shine brighter than they already do by delivering memorable experiences to millions in a way we couldn't do with any typical tour sponsorship." Stealing The Show: From In-Store To In-Concert The correspondent and 1DVIP blog are just pieces of the multi-faceted tour sponsorship that taps into both the snack culture and the hottest band in the country. 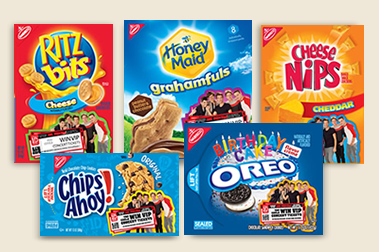 This first of its kind execution pairs the best of the band with Nabisco brands at home, in-store and in-venue. New Packaging. For the first time for any Nabisco brand, people will have the chance to access an augmented reality experience featuring the Band on more than 21 million specially-marked packages of OREO, CHIPS AHOY!, CHEESE NIPS, HONEY MAID Grahamfuls and RITZ Bitz. Each experience can be unlocked by downloading the 1D VIP app, pointing the mobile device at the package and scanning it to reveal a message from One Direction! Mobile - 1D VIP App. Fans can download the free 1D VIP app at either the Apple or Google Play stores, snap a photo of their favorite snack package with a mobile device and unlock an exclusive experience featuring One Direction. Once the experience is opened, fans can continually check back for new content, such as voicemails from One Direction and a cyber-photo booth where fans can create images of themselves with the Band. Fan Sweepstakes. 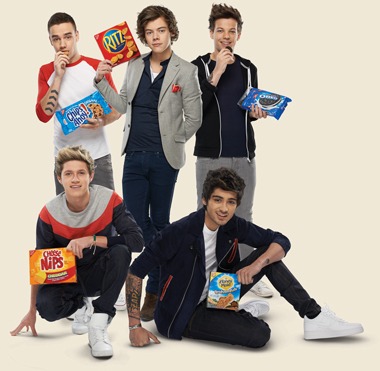 One Direction fans can enter for a chance to win VIP concert tickets and private access to one of three concerts through 1DVIP.com or specially-marked packages of OREO, CHIPS AHOY!, RITZ, CHEESE NIPS and HONEY MAID. Check it out before entries close on July 7. Showtime. For those lucky enough to have already scored a seat at one of the 35 tour stops, Nabisco will roll out the red carpet with in-venue exit sampling, never-before-seen videos shown during the concert and exclusive photo booth opportunities for attendees. 1DVIP.com. Along with the latest from the 1D VIP Tour Correspondent, the newly-launched website, 1DVIP.com, is the place to find summer-friendly recipes usingNabisco's beloved snack brands, tour news and video interviews featuring the band. Media. With partnerships that engage fans where they are already socially active, the makers of OREO, RITZ and TRIDENT are sure to reach fans frequently in the digital and mobile space. In-Store. More than 40 retailers nationwide will feature One Direction-inspired custom in-store displays; 21 million promotional packaging will be on shelves across the country; more than 48 million will be reached via FSIs; 20 thousand stores featuring shopper marketing activation along with in-store media activation more than 15 thousand stores will include 1D floor graphics and shopping card advertising. "The One Direction tour campaign is one of the biggest U.S. integrated programs our collective brands have launched in recent years," said Chriss. "With several ways that we're reaching our consumers, not just at the concerts but well beyond, we're giving a truly integrated experience that offers something for everyone – whether you're a fan of 1D or a fan of one of our brands." One lucky reader of Susan's Disney Family will win a prize pack that includes a full-sized package of a yummy Nabisco product with packaging that comes to life with a special video from One Direction and snack-sized portions of Nabisco cookies and snacks for your on-the-go reader. Oreos, Chips Ahoy!, and Ritz; oh my! Along with these goodies, this giveaway package will contain packages of our gum brands, promotional items including a 1D pen, a keychain and special recipe cards from 1DVIP.com. Would you like to win?? Please let me know what Nabisco product is your favorite. There are also other ways to enter, please enter below. Disclosure: The reviews and or opinions on this blog are my own opinions . I will receive the same pack for posting. No monitory compensation was received. I was not required to write a positive review. Your experience may differ. The opinions I have expressed are my own I am disclosing this in accordance with the Federal Trade Commissions 16 CFR Part 255: Guides Concerning the Use of Endorsement and Testimonials in Advertising . I have always loved Oreo cookies! I like Oreo's. Thanks so much for the fantastic giveaway! I love Oreos, for sure. They'll always be my favorite cookie. The original Oreos are my favorite, but the new Watermelon flavor is good, too! Thanks for the chance to win! My favorite are Nabisco Honey Maid graham crackers. Thanks. I love Ritz crackers the best. I always have. Oreo's have been a favorite of mine for a very long time. Although, Chips Ahoy aren't too bad either. I love Oreos.......they're the best. Oreos are the best, can't deny it! Oreos are my favorite Nabisco product. The cinnamon honey maid graham crackers! I love all the cookies and the Cheese Nips. I love a lot of their products. Birthday Cake Oreos, Cinnamon Honeymaid Graham crackers, Ritz . . .
my favorite are Halloween Oreos!! I gotta go with Oreos! ritz are my fav! it's my definition of "crackers"!! I <3 Chips Ahoy! Thanks for the opportunity. I can eat Ritz Crackers non-stop! My favorite is the OREOs. Oreos are a favorite around here. I love Ritz crackers the most! I love Oreo's Double Stuff cookies. Oreo's are my favorite, especially birthday cake oreo's. i love golden oreos! yum! I had some DoubleStuf Ores this past weekend! Nutter butters are my favorite! Ritz Crackers are my favorite. Oreo Double Stuffed is my favorite! Thanks for the giveaway…the kids love Oreos for an occasional treat !